"We can think of scientific knowledge as a consensus of experts." "There is a tendency among public intellectuals who are entirely reasonable in some areas to descend into the promotion of pseudoscience in others. Climate change scientists and journalists are still boiling over Naomi Oreskes' denialism accusation from December, when in the wake of the global Paris summit the Harvard historian wrote an article chastising four eminent researchers, including former NASA scientist Dr. James Hansen, one of the greatest proponents of global warming, for being "climate denialists." Why? Because, she said, they drew public attention to the consensus science view on nuclear power--that it could play a key role as a green alternative to fossil fuels because of the still limited potential of alternative energy--a perspective heretical to old school environmentalists. "There is also a new, strange form of denial that has appeared on the landscape of late, one that says that renewable sources can't meet our energy needs," she wrote. "It's like liberals attacking Bernie Sanders for not being liberal enough," noted scientist James Conca, writing for Forbes. On one side are what are often being called the ecomodernists -- liberal scientists and activists like Hansen and philanthropist Bill Gates who put pragmatism and cost-benefit analysis ahead of ideology. Pushing back are old school environmentalists, like Naomi Oreskes, Jim Green, Alan Jeffery and Paul Ehrlich, among others, who are deeply suspicious of the role of modern technology in addressing environmental challenges such as climate change; new energy extraction techniques such as fracking; or global food security--the GMO debate. Oreskes is the supernova of the 1970s-era environmentalists. "Her courage and persistence in communicating climate science to the wider public have made her a living legend among her colleagues," wrote two enthusiastic backers, Benjamin Santer and John Abraham, in a prize-nomination letter that led to her winning the 2011 Climate Change Communicators of the Year award. Others are not so generous in their appraisal. She was criticized for what many considered a harsh personal attack on renowned scientist William A. Nierenberg. And one target of her criticism, physicist S. Fred Singer, filed complaints, never upheld, challenging the quality of her research when she was at the University of San Diego. Is Naomi Oreskes, science historian at Harvard University and ardent supporter of the science of climate change, a visionary as her supporters claim? Or, as a growing number of critics maintain, is she a populist Luddite, the intellectual Rottweiler of in-your-face, environmentalism, unduly wary of modern technology, and whose activist policies are crippling environmental reforms? What is a 'Scientific Consensus'? Those are important questions in science, journalism and policy circles. Oreskes is the co-author of the 2010 book Merchants of Doubt, which likened climate skepticism to past efforts challenging the science consensus on cigarette dangers, ozone threats and acid rain. Oreskes and Merchants of Doubt co-author Erik Conway recently wrote a philosophical sequel to her bestseller, The Collapse of Western Civilization, in which they analyzed the world through the prism of environmentalist resource scarcity believers, such as the Club of Rome, Lester Brown and Paul Ehrlich. Ehrlich's 1968 book The Population Bomb made the Malthusian case that technology was hastening the imminent collapse of society. Of course, Ehrlich, a butterfly researcher turned apostle of environmental doom, was wrong, humiliatingly so, losing a widely publicized bet to techno-optimist Julian Simon that the cost of five major raw materials would go down rather than up as Ehrlich had infamously predicted. If scientists don't use a single method, then how do they decide what's right and what's wrong? And who judges? And the answer is, scientists judge, and they judge by judging evidence. That is to say, the burden of proof is on the person with a novel claim. And in this sense, science is intrinsically conservative. It's quite hard to persuade the scientific community to say, "Yes, we know something, this is true." So we can think of scientific knowledge as a consensus of experts. We can also think of science as being a kind of a jury, except it's a very special kind of jury. It's not a jury of your peers, it's a jury of geeks. It's a jury of men and women with Ph.D.s, and unlike a conventional jury, which has only two choices, guilty or not guilty, the scientific jury actually has a number of choices. Oreskes makes it clear that she is not 'appealing to authority', which rests on the logical fallacy of assuming an individual is correct on an issue merely because she has a degree or a position of power; rather, Oreskes says, this is putting policy in the hands of "collective wisdom"--a PhD geek squad of sorts. On communicating about the science behind climate change, Oreskes walks her talk. A 2015 PEW survey of the American Academy for the Advancement of Science found 87% of scientists who responded embraced the evidence that global warming is being driven, at least in part, by human activity. But what happens when the views of the geekers and the mainstream liberal environmental community diverge? When that happened with Ehrlich, he abandoned the hard science and instead embraced political activism, empirical evidence be damned, and we know how that turned out. As for Oreskes, let's assess her views on two issues beyond the climate change debate in which there are clear examples of a scientific consensus: agricultural biotechnology--the debate over so-called GMOs; and nuclear energy. Some 65% of AAAS scientists favor building more nuclear power plants--a clear though not overwhelming consilience. Why? Because nuclear power generates green energy and does not rely on fossil fuels. A group of scientists, journalists and policy wonks calling themselves eco-modernists have laid out a green case for nuclear energy in numerous forums. "Nuclear fission today represents the only present-day zero-carbon technology with the demonstrated ability to meet most, if not all, of the energy demands of a modern economy," the group declared in what has come to be known as "An Ecomodernist Manifesto". Ecomodernists--liberal thinkers who embrace, within limits, the positive role of technology in solving intractable environmental challenges--are the intellectual antagonists of Oreskes, who carries into the modern culture wars the 1960s and '70s environmental movement's suspicion of science, and technologically-based solutions. 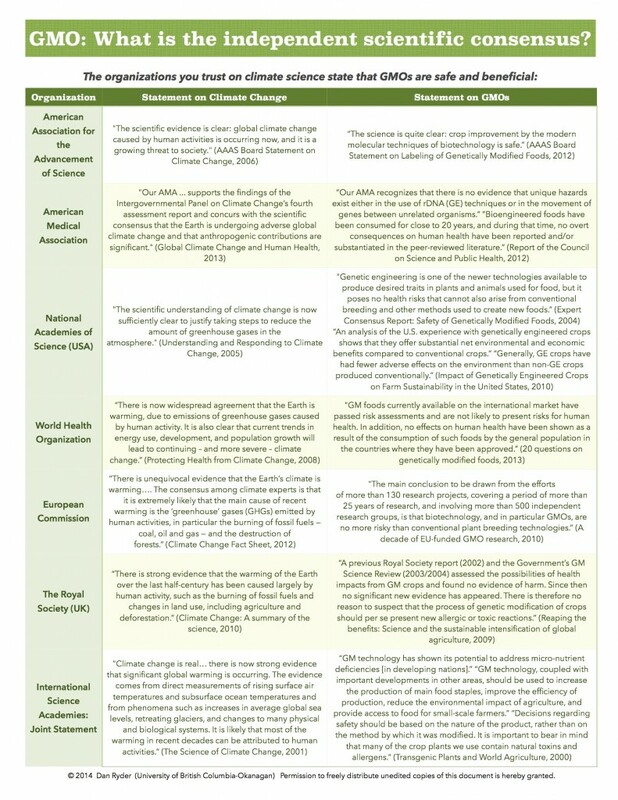 The consensus view on GMOs is even stronger than on global warming: 88% say GMO foods are no less safe than conventionally bred or organically grown varieties--a position endorsed by some 270 organizations around the world, from the National Academy of Sciences to the Union of German Academics of Sciences and Humanities to Food Standards Australia and New Zealand. Now that's a PhD geek squad. Interestingly, many of these independent science agencies (including the German Academy) are on record stating the GM crops are more sustainable than conventional or organic alternatives. The Genetic Literacy Project has posted an infographic assembled by Dan Ryder of the University of British Columbia with side-by-side statements by many high profile science groups on climate change ('human induced') and GMOs ('safe'). I think to jump to the conclusion that the solution is nuclear power or genetically modified crops is, let's just say, not supported by the evidence. ... One of the things we know about technology is that it's almost always a two-edged sword. It does some things for us very well but it often creates other different problems. Oreskes' defensive response is odd. No one has suggested that "the solution" to any challenge is nuclear power or GM crops. No serious person believes in Oreskes' strawman argument that technological solutions like GMO based farming (higher yields, lower chemical inputs, no and low till farming to reduce carbon emissions, reduction in the use of methane-creating cows) will reduce all carbon emissions and usher in a golden ecological age. But GM crops and nuclear power provide demonstrated sustainability benefits that even Oreskes can't pretend to ignore. Can nuclear energy and GMOs be tools for use by progressive problem solvers? The consensus is overwhelmingly "yes." Oreskes' blanket dismissal of crop biotechnology because of fears of potential collateral consequences--without detailing any actual reality-based dangers--is a classic tactic wielded by anti-modernists, from Ehrlich to Friends of the Earth and Center for Food Safety. "A rational analysis has to involve a consideration of the benefits and risks, without fear mongering about the risks or undefined 'damages'," Karlsson wrote. "Naive applications of the precautionary principle simply will not cut it." The fact is that the "solution" to any prickly problem involves trade-offs--even and especially alternative energy, such as wind, sun and water power, as preferred or exclusive ways to address global warming. Many independent minded sustainability experts are critical of hydro-based energy because it results in destroying rivers to create dams; wind power has that annoying problem of chopping up birds; the sun is great, when it shines, which happens in the desert, but not so great in most of the world where the energy-sucking population centers exist; the list of precautionary trade-offs is endless. Critical thinkers engage in cost-benefit analysis; they don't just dismiss innovative technologies. Oreskes views sound very much like Ehrlich's popularly embraced 1960s dogma that the scientific consensus agrees was so wrong--and the views of early nineteenth century Luddites, who fancied themselves as 'progressives' while they fought against the the early industrial revolution in Europe. In recent years, Yale University's Dan Kahan has led an interdisciplinary team of scholars in what they call the Cultural Cognition Project, exploring why individuals often abandon logic when it comes to forming beliefs about contentious social, political and science issues: gun control, vaccine safety, climate change, fracking, biotechnology--there is a long list. Kahan and his fellow scholars suggest that many of our most strongly held positions, while dressed in the garb of independent critical thinking, rationality and science, are actually rooted, irrationally, in the tribal-like beliefs of our fellow ideological travelers, our extended families who give form to our cultural identities. That provides an intriguing framework for understanding Oreskes views and her massive public following. She is a living embodiment of the Precautionary Principle, the European originated notion, fervently supported by old school environmentalists, that we should be wary about embracing change because of the potential for extreme collateral damage. It's a dystopian view, fearful of the ecological havoc that man, through technology, could wreak on the world. Oreskes is most accurately understood not as a futurist, as she fashions herself, but as a backward looking techno-fearing conservative locked in the ideological cocoon of the precautionary obsessed environmental movement. One more thing about genetically modified crops. Again there's no question in my mind that genetically modified crops could be useful for certain kinds of things. But the idea that they will solve this problem is naïve and ignorant in the extreme. Because look at the Green Revolution. The Green Revolution was supposed to be the fantastic application of technology to solving a major human problem. And what happened? Well it definitely helped. There was definitely very significant progress and we don't want to downplay the progress that was made. But where are we today? Well 2 billion people on this planet are still hungry and they're not hungry because we don't have enough food. They're hungry because we don't know how to distribute and store and get food to the people who need it. That's not a problem of technology. That's a problem of human institutions. I'm with Karlsson in his comment that blaming global food security concerns on distribution and storage--a meme straight out of the most ill-informed factions of the anti-GMO movement (here, here and here), is "ignorant in the extreme." In the next few decades, the global population will increase to more than 9 billion people, according to UN estimates. Combine that with increasing incomes in the developing world and that means, experts say, we need to roughly double foot output--and do so by farming less land than we use today, all while dealing with climate instability. Organic farming, with a documented 20-40% yield gap compared with GMO and conventional crops (USDA, PLOS ONE meta-analysis), is a seductive idea, but the malnourished can't eat romanticism. As everyone from the Gates Foundation to the UN's Food and Agriculture Organization maintains, we can't meet the humanitarian challenge with half-baked appeals to store food more efficiently. [A]s negotiators were closing in on the Paris agreement, four climate scientists held an off-site session insisting that the only way we can solve the coupled climate/energy problem is with a massive and immediate expansion of nuclear power. More than that, they are blaming environmentalists, suggesting that the opposition to nuclear power stands between all of us and a two-degree world. To solve the climate problem, policy must be based on facts and not on prejudice. The climate system cares about greenhouse gas emissions--not about whether energy comes from renewable power or abundant nuclear power. Oreskes' rebuke brought back memories of her strident attack of William A. Nierenberg in Merchants of Doubt. Widely considered a brilliant scientist who advised presidents and NATO, he spent decades striving to mesh technology and policy. Oreskes dismissed him as, well, a denialist, comparing him to Dr. Pangloss, the character in Voltaire's Candide who is delusionarily optimistic about the future. New Yorker science writer Michael Specter, author of the book Denialism, joined numerous other progressive scientists and journalists in challenging Oreskes' denialist broadside. You don't have to be a supporter of nuclear power to realize that words have meanings, and 'denialism' is not a synonym for disagreement. ... Rather, it implies willful, and often hateful, ignorance. Denialists are people who inhabit their fictions and run from the truth. They don't believe there was a Holocaust or a final solution; they insist, despite indisputable molecular evidence, as well as the deaths of tens of millions of people, that AIDS is not caused by H.I.V. They are people who believe that angels are real and that evolution is false. As critics of Oreskes noted, none of the men she ridiculed had argued for even slowing the commitment to developing non carbon based energy sources. But they are realists, recognizing that in crisis policy challenges, such as climate change or global food security, we need all hands on deck. Or, as environmental activists Ben Heard wrote in a tweet in response to Oreskes, "This thrash of insult against senior climate scientists for wanting all tools deployed is foul and degrades us all." There is a huge irony here, as well. In playing the denialism card, Oreskes is engaging in the same gutter personal attack tactics that she decried in The Merchants of Doubt. The intellectual hypocrisy is even deeper. She slams nuclear power as economically unsustainable because its partly subsidized by the government. Note that she fails to acknowledge that solar, wind and other alternative energy sources would have no chance of competing in the marketplace without huge government handouts. Oreskes' entire argument rests on a highly controversial study by Stanford University professor Mark Jacobson and colleagues making the case that wind, water and solar energy are cost competitive with nuclear and more traditional energy sources. Jacobson's antipathy toward nuclear power is well documented. Many critics have questioned, even shredded, the study's methodology, and even progressives, such as Julian Spector writing in Mother Jones, challenged his often simplistic assumptions. But true believer Oreskes swallowed it whole. Echoing the practices of the Big Tobacco researchers that she artfully (and mostly accurately) decried in her bestseller, she relentlessly trumpets that one cherry pick study as the 'final word,' ignoring the consensus science. That kind of doublespeak is what happens when tribal values, arrogantly but mistakenly framed as "progressive" and "liberal", are substituted for reasoned, empirical based thinking. Oreskes is backward-lookingl environmentalist who will bend the facts to support her argument--exactly the kind of Orwellian intellectual she savages in her books and public talks. As Emil Karlsson has written in describing Oreskes, "There is a tendency among public intellectuals who are entirely reasonable in some areas to descend into the promotion of pseudoscience in others." Consensus science? Sure, when it coincides with one's politics. Being very smart and high profile, it appears, does not make one science-minded, let alone wise.